Meet Jo from Lost in the Haze. We first came across the twenty-two year old form Christchurch, NZ and fell in love with her dreamy photographs and love reading about all of her adventures. Peter pan collars, floral wallpaper, going on adventures and cupcakes, just a few of the things Jo lists as things she loves and we couldn't agree more... definitely a girl after our own hearts! 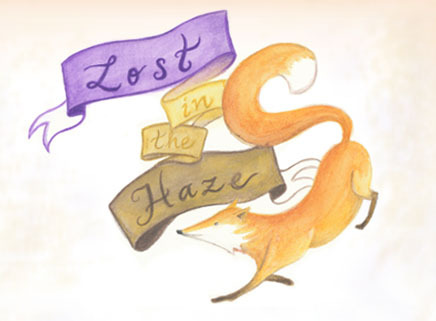 Ok, first up who is 'Lost in Haze'? Lost in the Haze consists of me, Jo, and my long-term love, Barnaby. I am a vintage enthusiast and am constantly scouting the local vintage stores to see what I can get my hands on! Barnaby is a genius with cameras, and he does all of the beautiful photography and behind-the-scenes work. It is definitely a plus being able to work with my best friend! I have been blogging since February 2011; so five months now! I have been an avid blog reader for about three years, and felt that I had something different to offer. I live in the city of Christchurch, New Zealand, which has the most beautiful landscapes. The blog was partially created to show off the beautiful scenery, and partially to show off my love for vintage fashion, DIYs, and just generally cute things! I am notorious for going on many scenic excursions, and this definitely plays a role in my blog inspiration! I am also inspired by quirky and stand out garments I find when thrifting. I regularly look at vintage magazines (particularly from the 1960s!) when I am feeling a lack of inspiration, and they never cease to let me down! I would definitely say that my style is a bit of a mish-mash! I often take key elements of the 1960s and 1970s, like mini dresses and velvet fabric. I love quirky staple items; such as my peach coloured faux leather shorts! I am also crazy about nautical elements to my outfits, and have been known for never turning down a sailor collar. I adore cute pan collars and elbow patches, and often think to myself that I dress like a cross between a young child or an old woman. My iPhone (I am truly addicted to Crash Bandicoot racing! ), my woolen toy panda; Bales, and my faux fur lined desert boots which are getting me through winter! I'm currently a full time university student who graduates in December (I am already planning my graduation outfit, eek!) I also run an online boutique which sells both new and vintage items. Lastly, I also do a bit of freelance work on the side. I am a long-term vegetarian! When I turned eleven I decided I didn't want to eat meat anymore, but gave up on my first night and ate a saveloy! Whoops! I've been good ever since though, and have now been a vegetarian for eleven years. This season I am crazy about colourful plaid prints and flower crowns. I have also found myself eyeing up a pair of creeper shoes!